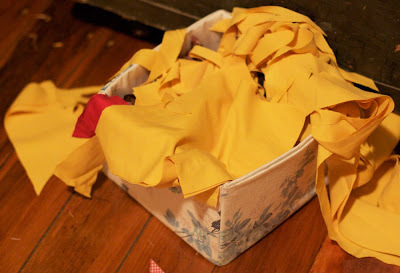 So I found a yellow bed sheet in my stash, it's really thick and soft and doesn't crease too much! I made a little mess, that's my little scrap box on the floor there... I like to have it by my feet as when the bobbin needs rethreading or you wanna test the tension it's good to have the scraps close by... plus you can use them later for other stuff too... I think the material hasn't been in the stash too long actually, as it may have come from a recent Tempe Tip (Salvos in Tempe) Trip. My new scissors... They're KIA brand I think and how lovely is the focus on the camera... I'm testing out the M function on the Canon... I usually use automatic or P (for Practicing I call it!)... but the focus is amazing using M! And the actual frock! I've cut it shorter (this version pictured would be at my ankles. I'm such a shortie!) to my knee, but will adjust later. And I'm also making the shorter sleeve (pink) version. I love how the bodice wraps and is tailored into the waist... I'll see how it goes and post tomorrow! I was about to use some gorgeous material my Mum brought me from Vietnam, but thought since I've not used the pattern before I should test it out on some second hand cheaper material first! Love the colour and the pattern. So cute!!! 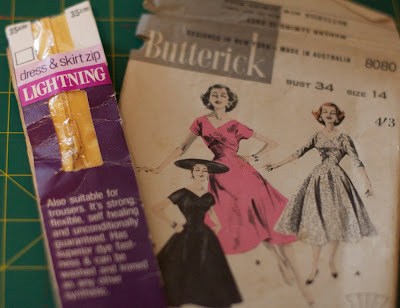 Am totally envious of how you always find these fab vintage patterns & notions, I never have such luck!!! The colour is amazing, can't wait to see how it turns out. 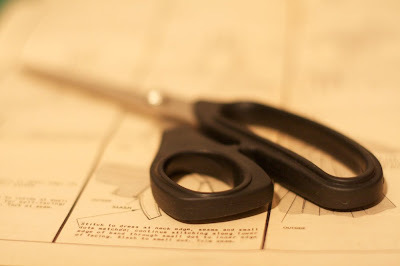 I have KIA scissors as well! Gareth got me a pair about 2 years ago, but they are HUGE, they make normal scissors look tiny, but they are good. I got a little pair as well for my badges, although I think I need to take both in for a sharpen. I call them my Japanese Steel! ooohhhh, I'm soooo jealous of this pattern find! !